What do you remember about the last wedding you attended? Looking for a white dove release in Minnesota? Every girl dreams of her wedding day, now it is time to make your dreams come true. Make your wedding day unique and memorable. A year from now they won't remember the color of your bride's maid's dresses but certainly will remember your white dove release. Are you looking to do something different than everyone else? A white dove release might just be the answer! 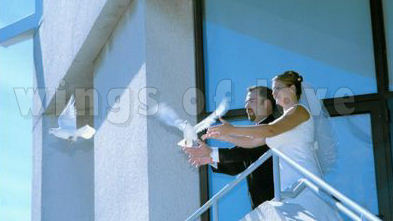 Snow white doves released a your wedding are a blessing to the bride and groom. 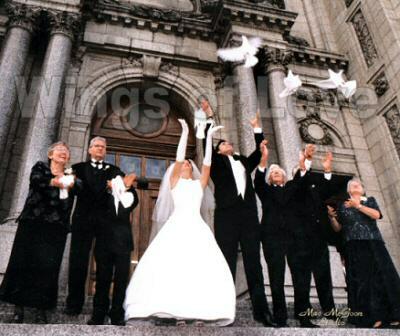 White doves mate for life so they are a symbol of your eternal commitment to each other.White dove releasing is a gorgeous and elegant expression of peace, love, and commitment. The breathtaking sight of snow-white doves circling above brings about feelings of joy and new beginnings. Know that we have been releasing snow white doves in Minnesota for over 8 years, and were a founding member of the White Dove Release Professionals (see below.) 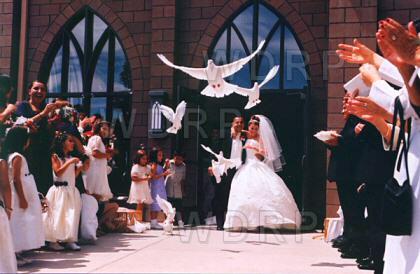 We can professionally release 1-100 live snow-white doves at your wedding to creating a beautiful sight to be enjoyed by all, not to mention being the talk of your wedding reception!